The world class FX, sound design and beds that powered two of the biggest radio networks in the UK are now available to image your station. At an amazing price. CHR FX complete is the powerful combination of CHR FX volume I and CHR FX volume II and is the sound behind The Galaxy Networkand The One Network. The package comprises 240 cool, contemporary and one hundred percent usable effects cuts, impacts and beds. 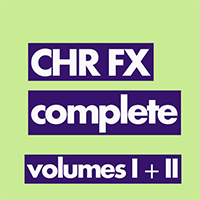 CHR FX complete is now available to purchase and as a buyout and download in full quality WAV.